Being a South-Indian, I have never failed to add curry leaves to any of my dishes. The BBC food describe them as “shiny, dark green, aromatic leaves from the citrus fruit family that release a delicious nutty aroma when fried in oil”. As the name suggests, it is used widely in curries hence the name ‘curry leaves’ and this is extensively used in Indian and South East Asian cuisine. Every time Mom cooked and added these curry leaves, I would simply remove them from my meals, keep them aside and off it goes in the bin! I did that every time I cooked or anytime I found them, only because I found it like an extra terrestrial in my meals. Lol. It was until a few years ago when I saw my aunt and cousin cooking, they chopped these leaves really tiny and added them to the hot cooking oil. I thought that was very clever because it is finely minced and it mixes up with the rest of the ingredients so I wouldn’t have to pick them and throw them away! These are just basics I wouldn’t have thought of whilst I am cooking. Ever since, I have been mincing them and adding them to just about anything I cook. Be it pasta, noodles or omelet. -Chewing on raw (washed!) 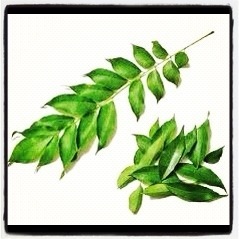 curry leaves everyday is known to promote weight loss and reduce cholesterol levels in the body. -Regular intake will improve eyesight. It is also believed to prevent cataract. -These leaves stimulate digestive enzymes which helps to break down food more easily. -They help in hair growth and also avoid premature greying of hair. -They also help in better blood circulation. -Curry leaves juices are known to treat minor burns and itching caused by insect bites. -Overall, these curry leaves are known to have huge medicinal benefits and have been widely used in Ayurvedic medicines since centuries to treat piles, diabetes and other ailments. Thanx for the valuable information.